Be jazz guitarist does not mean that you have to play only guitarist's solos. It's very important to transcribe lines of other instruments like sax, trumpet or piano for example. This way you will change your habits and you will play some jazz lines that maybe you would never have played before. 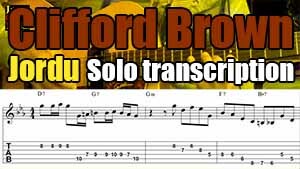 This lesson is about a Clifford Brown trumpet solo transcription in "Jordu". Clifford Brown was an American songwriter and jazz trumpet player. He composed two jazz pieces which have become standards, "Joy spring" and "Daahoud". He has collaborated with jazz players as Art Blakey and Lionel Hampton before forming his own group with the drummer, percussionist and composer Max Roach. II7-V7-Im sequence (D7-G7-Cm) which is a minor II-V-I with a dominant 7th (V7) chord instead of the usual minor seventh flat ninth chord (II). II7-V7-IM sequence which is a major II-V-I with a dominant seventh (II7) chord instead of a minor seventh chord (II). This jazz guitar lesson show you how to play altered lines over a dominant seventh chord with a major triad. You're wondering what scale to play over a dominant 7 chord, this lesson is for you. This blog article provides useful tips to take your knowledge to the next level. 12 options with scale charts, analysis and guitar diagrams for improvising over V7 chords are provided to you.